‘Who would have ever believed this...’ said Nick Offerman. Married actors Mullally and Offerman have crisscrossed their show biz careers and have had triumphs on their own. Megan Mullally just has relaunched Karen, her most familiar TV character, on the NBC reboot of “Will & Grace.” Nick Offerman, who was also known for TV as Ron Swanson on “Parks and Recreation,” did his first lead film role in 2018, Brett Haley’s “Hearts Beat Loud.” The husband and wife team – who also had done time in Chicago earlier in their performance lives and met doing a stage play – also was in town to present their traveling show, “Megan Mullally & Nick Offerman Unscripted,” which filled the Chicago Theatre in the Loop. Photographer Joe Arce and Patrick McDonald of HollywoodChicago.com covered the Red Carpet event at Prime & Provisions Chicago on October 2nd, 2018. Click “Next” and “Previous” to scan through the slideshow or jump directly to individual photos with the captioned links below. All photos © Joe Arce of Starstruck Foto for HollywoodChicago.com, except slide five (Sheryl Nields for Michigan Avenue Magazine) and slide six (Patrick McDonald for HollywoodChicago.com). NICKMEGAN1: Dynamic Duo: Nick Offerman and Megan Mullally. NICKMEGAN2: Megan Mullally’s father Carter was a actor at Paramount in the 1950s. NICKMEGAN3: Nick Offerman was a co-founder of Defiant Theatre in Chicago. NICKMEGAN4: Editor J.P. Anderson (left) & President Dan Uslan of Mich Ave Mag with cover stars. NICKMEGAN5: Cover Stars Nick and Megan. NICKMEGAN6: ‘Who would have ever believed this…’ said Nick Offerman. 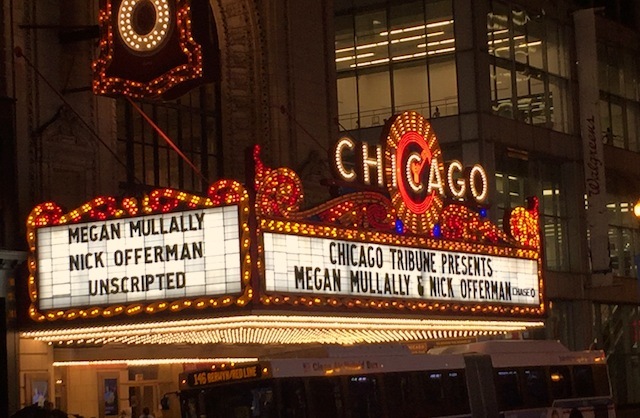 For a Red Carpet Talk with Megan Mullally and Nick Offerman, by Patrick McDonald of HollywoodChicago.com, click here. For more information about Michigan Avenue Magazine, click here. For more information about Prime & Provisions Steakhouse, click here.